On August 3rd last I published "Exploring Ireland's Wild Atlantic Way" to the Kindle platform on Amazon. While the book was also re-published as a paperback a month earlier, I had the problem of how could I generate sales if no one knew it existed. When the book came out first in 2014, I had the publicity of two radio interviews (RTÉ and Newstalk), lots of Tweets, it was the first book about the WAW, and there was also lots of publicity from Fáilte Ireland as they officially launched the WAW that year. Now there are several books, including one by David Flanagan and Richard Creagh who stole my title (apparently that is allowed, there is no copyright on titles). August is also late in the year to release a book about the WAW. I ran the campaign from the 8th of August to the 7th of September. The ad was displayed 41,697 times, but only generated 266 clicks. It is only when a computer user clicks on the ad that I have to pay for it - you can see above that these 266 clicks cost me $62.10. So did this campaign work? Sort of. 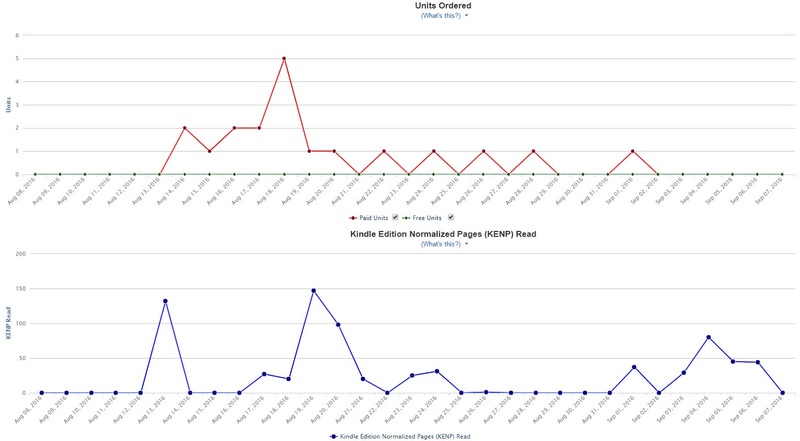 The sales for the Kindle version of the book during the campaign are charted below. 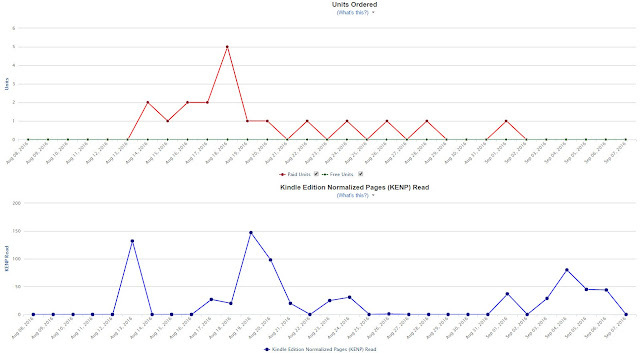 It shows 19 books sold (red line) and some readers who accessed the book through Kindle Unlimited (blue line). The revenue from the sales above fell just short of campaign spend - the book is very cheap (£3.77) on Amazon. Since the campaign ended on Sept 7th, I have sold just four books in just over a month. It is safe to conclude that advertising generates sales, though not enough in my case to cover the cost. I will give it another go around May/June next year when tourists might be planning a holiday on the WAW - I may need to adjust the price upwards a little to cover costs. I found this post while doing a search for Exploring Ireland's Wild Atlantic Way. I'm the publisher and co-author of the other book that shares that name. As you note there is no copyright on titles. When we settled on the name your book was out of print so we didn't think it was an issue. Admittedly its not an ideal situation but I hope you aren't too put out by it. Absolutely no problem at all. You are correct, it is out of print from the original publisher The Liffey Press. The book sold well for about six months before going out of print - publisher regrets not having printed more in the original print run, but did not have enough orders to justify a new run. This year I took the book back and used Createspace to make it available print-to-order - but this is too expensive. I also have it in Kindle. Best of luck with your version - I hope to check it out in the book shops. Thanks Eugene. And same to you with yours. Going to check out amazon advertising. Thanks for the post.